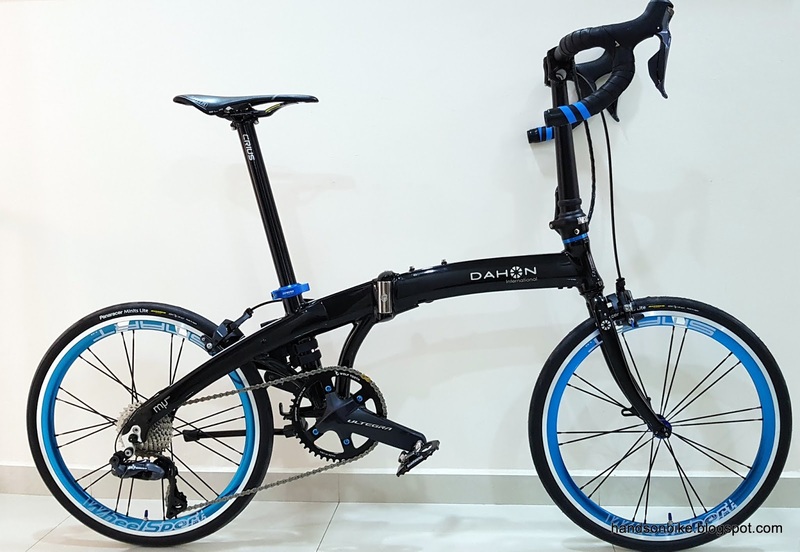 Finally, after much effort, plus trial and error, the Dahon MuSP has been completed! 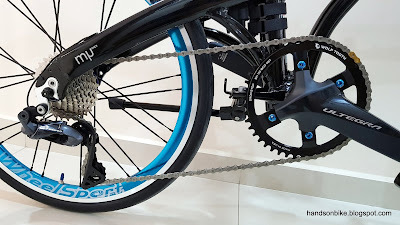 This is a folding bike with 451 wheels, drop bar and caliper brake setup, 1x11 speed drivetrain with Di2 shifting, and internal cable routing. Let's take a look at the final product! 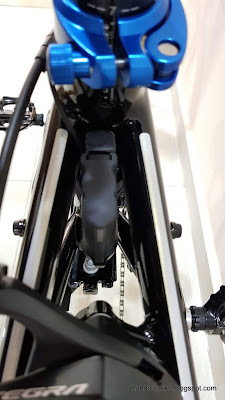 Di2 battery located behind the seat tube. 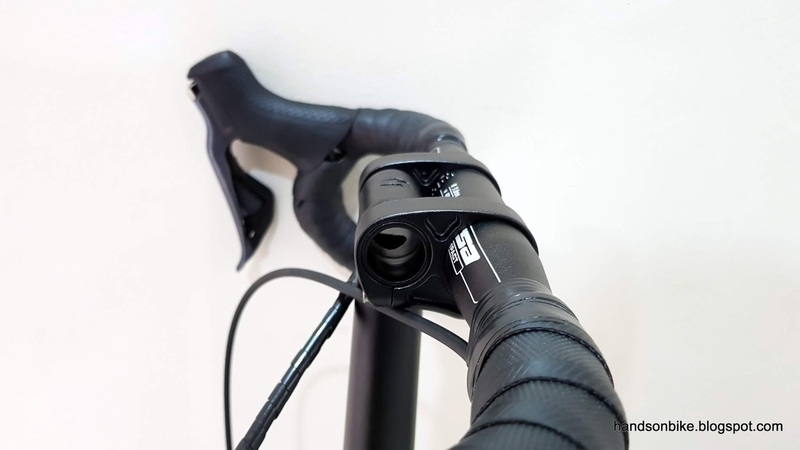 The Di2 wire runs from the battery mount to Junction B (hidden inside frame), together with the rear brake cable through the same hole in the frame. Top view of the battery location, which is hidden between the seat stays. 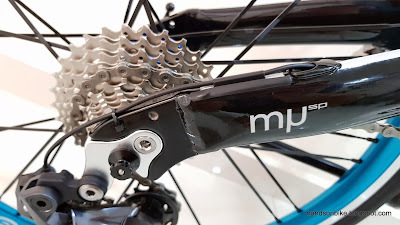 Di2 wire to the rear derailleur exits from the right side seat stay. 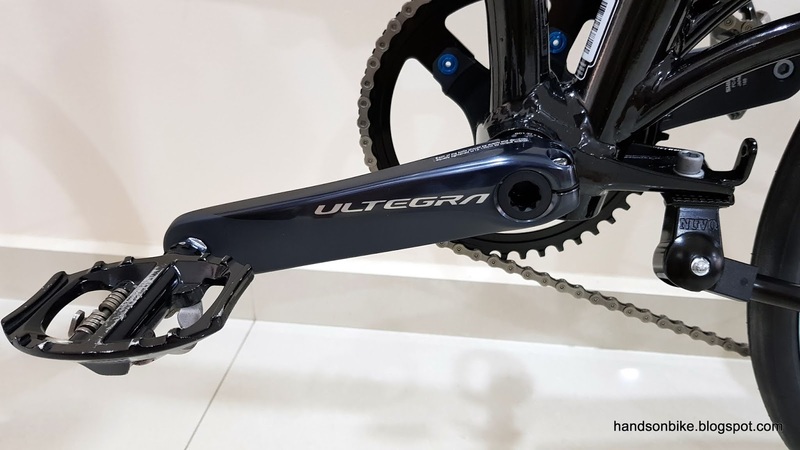 Ultegra R8000 road caliper brakes, which fits on this bike without any modification or adapter required! Blue Wheelsport hubs, which have a different shade of blue from the rims. 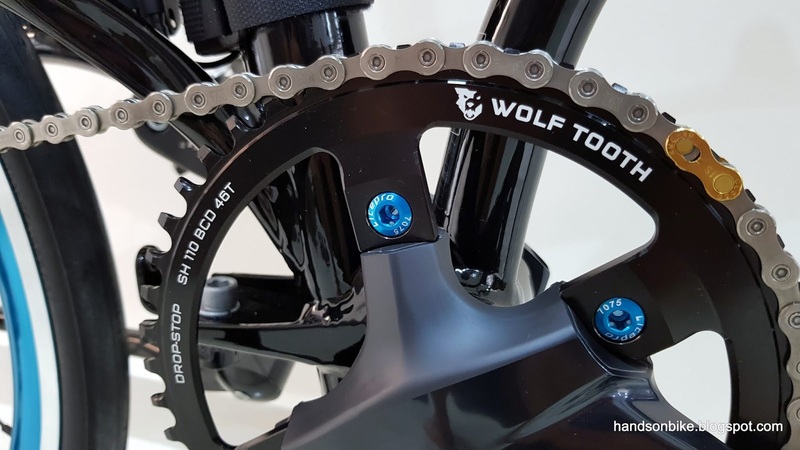 Lightweight titanium quick release axles. 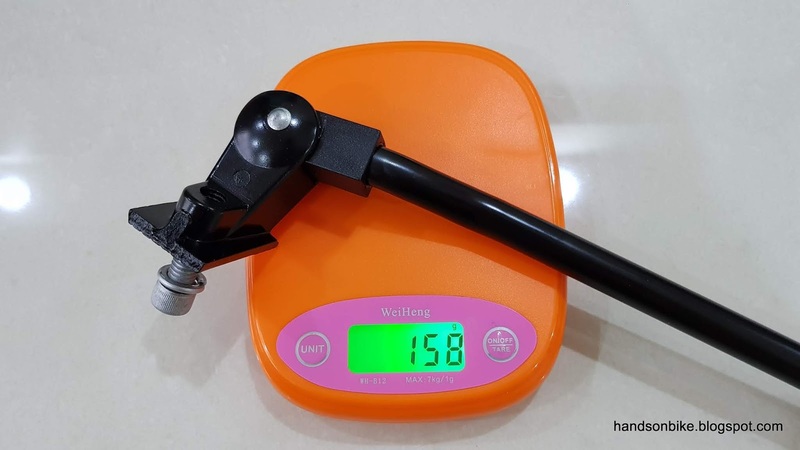 Stock lightweight kickstand from the Dahon MuSP, which only weighs 158 grams. Optional but very useful to have! View of the bike from the drive side. 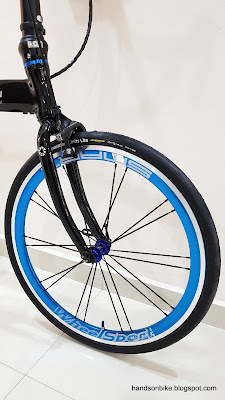 Blue accents on the frame makes it more special! 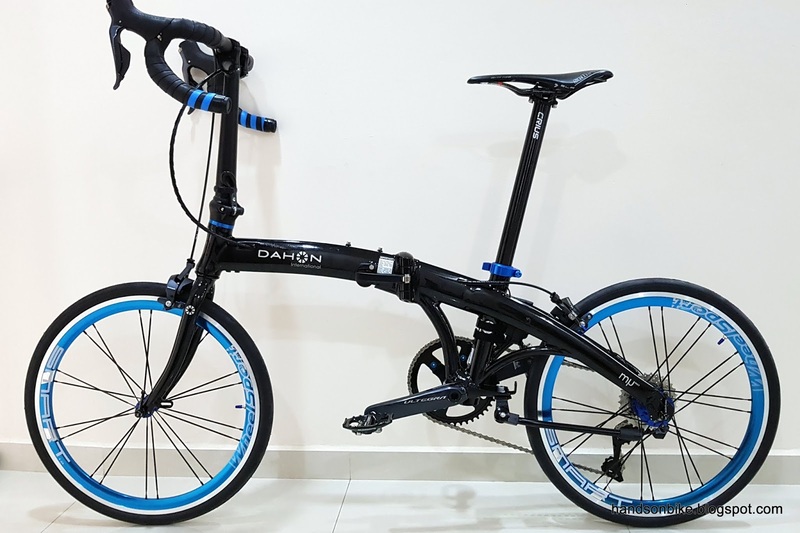 Full specifications of this Dahon MuSP. 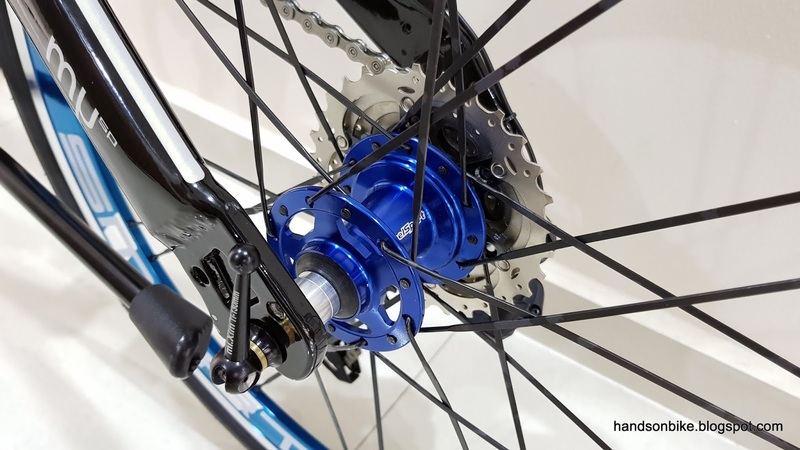 Weight without pedals and kickstand (usual standard for comparing weight with other bikes) is about 9.1kg. 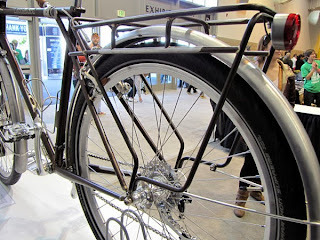 Comparing the weight of this bike to a few other bikes which I have weighed, let's see where it stands. 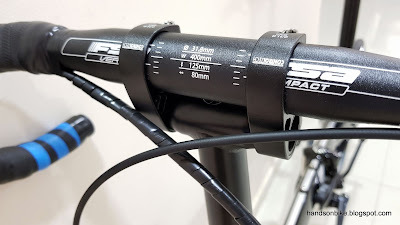 Flat handlebar and drop bar bikes cannot be compared directly, as the handlebar setup is different which makes a drop bar bike heavier than a flat handlebar bike. All weight comparisons are done without pedals, kickstand or any other accessories. From this comparison, the 9.1kg weight of this Dahon MuSP is not too bad, as it is actually the second lightest folding bike, after the flat handlebar Dahon MuEX which is just 8.4kg. Non-folding bikes normally have a weight advantage as they don't need to strengthen the joints or have the folding mechanisms. The handlepost used for this Dahon MuSP is still quite tall, despite getting one that is shorter (27cm) than the stock handlepost (31.5cm). 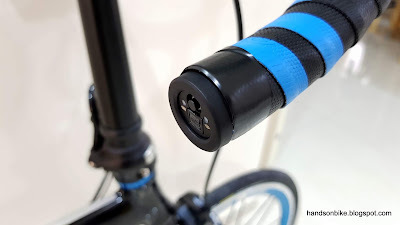 There are handleposts that are even shorter (about 25cm), but they don't fit the requirement of a T-shaped, inward folding type. 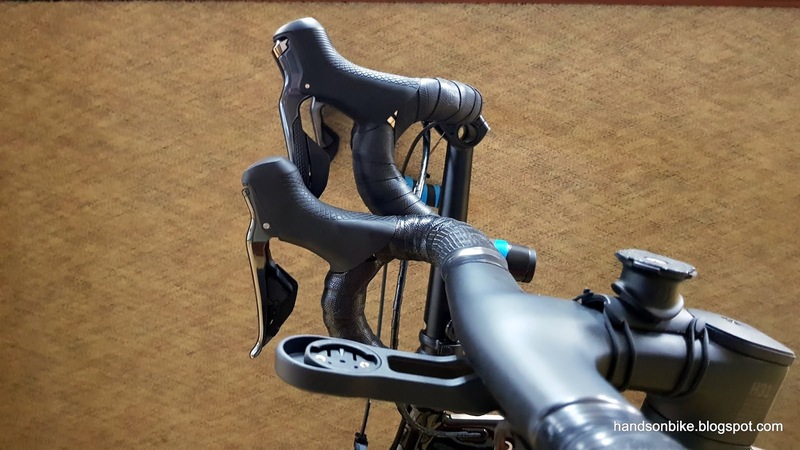 As a result, the handlebar is still positioned relatively high, when compared to a road bike. 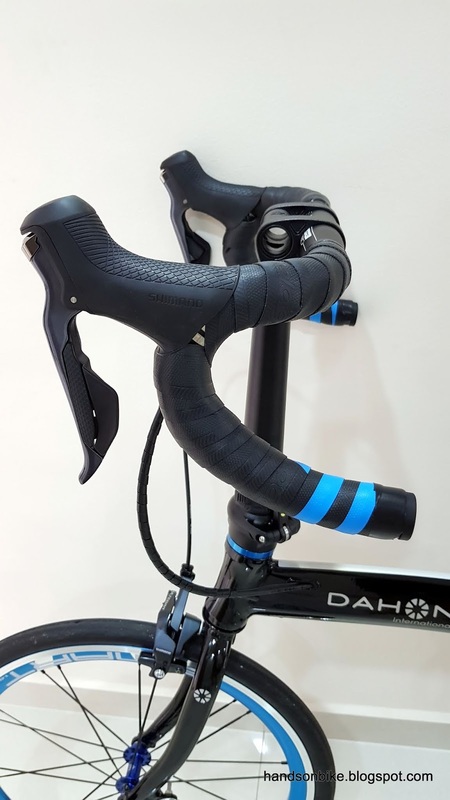 Dahon MuSP with the Controltech stem angled 45 degree upward/forward, which is the angle that I used when tesing this bike. 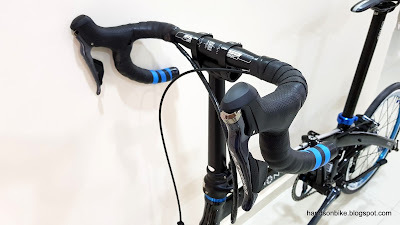 Still a lot higher than the handlebar of the Canyon Endurace in the foreground. 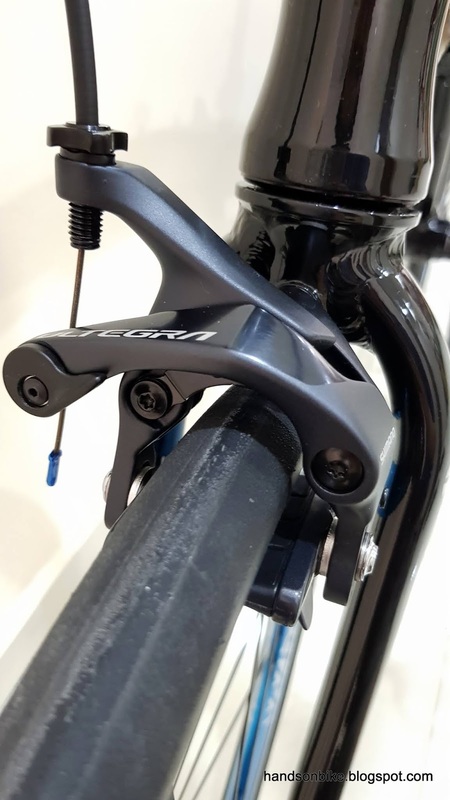 As mentioned earlier, the main purpose of having the Controltech stem is to allow the handlebar to be placed BEHIND the handlepost, as it will be used for a smaller rider with a shorter reach. Therefore, let's see how it looks like when we actually rotate the stem to be behind the handlepost. With the stem rotated to place the handlebar behind the handlepost, the handlebar is now lower as there is no vertical extension provided by the stem. In this setup, the handlebar position looks to be just right for a shorter rider, as it is lower and further back. This Dahon MuSP has finally been completed! I am happy with being able to install standard reach road caliper brakes on a folding bike, as it ensures good braking performance when paired with a road shifter. 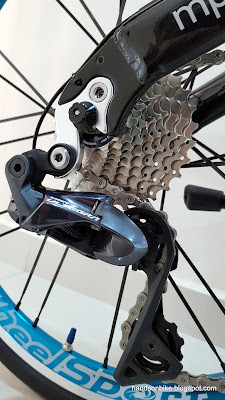 The internal cable routing is good because it makes the appearance much neater, especially with the bar end Di2 Junction A. 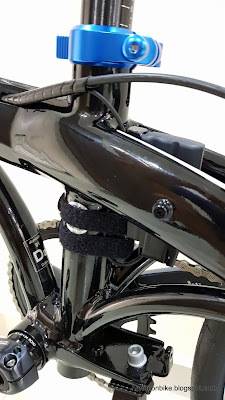 On the other hand, during folding and unfolding, the rear brake cable will slide through the hole on the frame, which causes it to be damaged by the sharp hole edge. 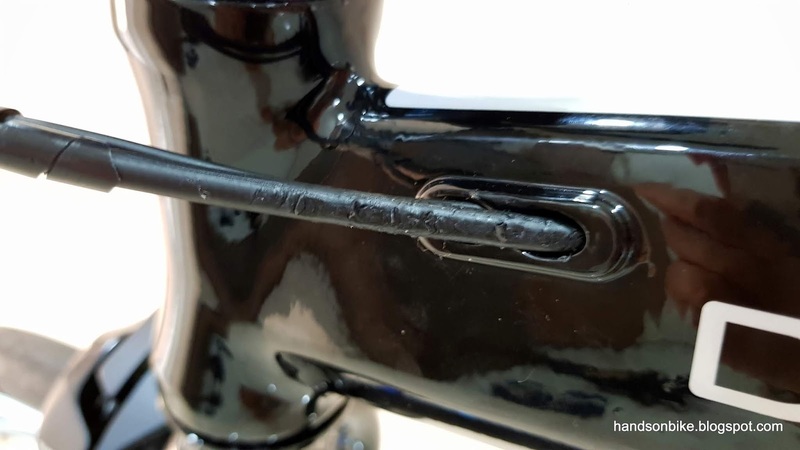 This is a problem as the plastic layer on the outer casing will get scraped off easily, exposing the metal coil of the outer casing. The solution is to minimize the folding of the bike, and also to carefully guide the outer casing through the hole during folding and unfolding. Not ideal, but it is the only way to deal with this issue. External cable routing would eliminate this issue, at the expense of a less tidy cable routing. 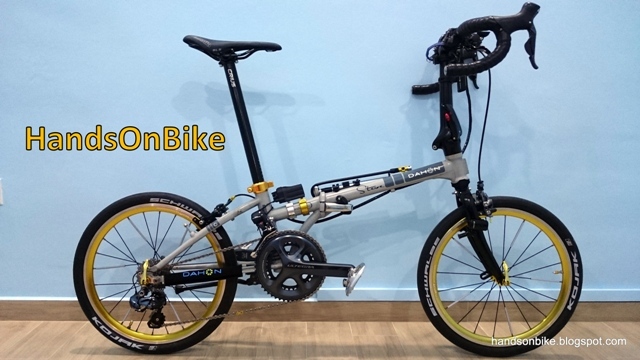 After testing this bike for an extended distance of 60+km, it is all ready to go. It is not for my own use, but I build every bike as if it is my own, ensuring that it is adjusted correctly and optimally. Yet another bike project has been completed!